MCG003 4" X 5" ICON MATTED TO 8" X 10"
Saint Th�r�se of the Child Jesus and of the Holy Face continues to captivate and guide hearts at the beginning of the Third Millennium. 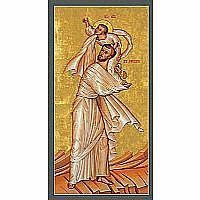 Her humility and confidence, her complete abandonment to God opened her to His gifts of deep love, wisdom and spiritual maturity. She has now been given the title of Doctor of the Church. In this image by Sr. Mary Grace, O.S.C., St. Th�r�se is shown holding the icon of the Holy Face. Her gesture is one that expresses her intense love for the person of Jesus Christ as well as her particular devotion to the mystery of his Holy Face. 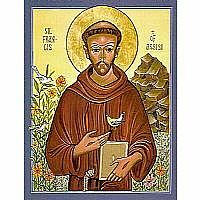 This devotion began with St. Th�r�se�s entrance into Carmel, and increased during the humiliating illness of her beloved Father. She said of herself: "Those words of Isaiah: "Who has believed our report? There is no beauty in him, or comeliness... ' have been the whole foundation of my devotion to the Holy Face, or, to express it better, the foundation of my whole piety. I also have desired to be without beauty, to tread the winepress alone, unknown to every creature." Wood-mounted icons are on 3/4" poplar or 5/8" Pro-Wood, with with tee-slots milled in the back for easy hanging. 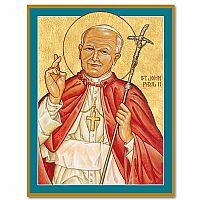 Icons are finished in classic cherry to replicate the traditional icon red, in keeping with Byzantine tradition. (Ancient icon board edges were frequently coated with red bole, a form of clay). Each mounted icon comes with a descriptive pamphlet explaining the symbolism and history of the image. Please allow 5-10 business days for orders of 20 or more icons. 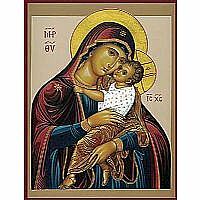 Our icon designs are also available in sanctuary-size enlargements up to 38 inches wide. The latest technology enables enlargement without sacrificing quality. Call 800-889-0105 for pricing and ordering. 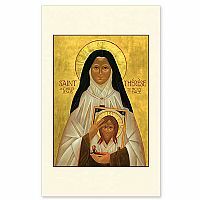 Saint Thérèse of Lisieux was born Thérèse Martin in 1873 in Aleçon, France. She entered the Carmelite monastery at Lisieux at the age of 15, following two older sisters. 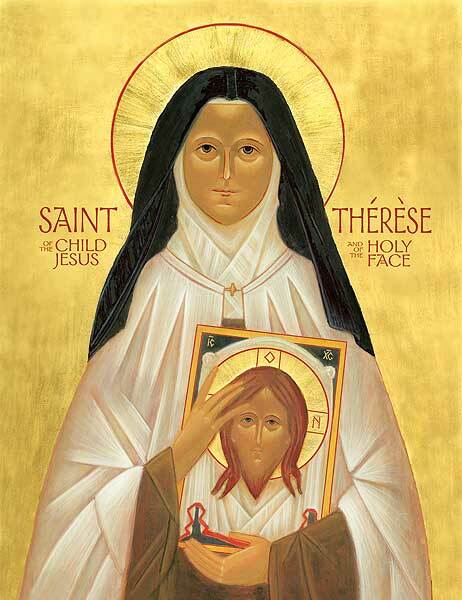 She took the name of Thérèse of the Child Jesus and the Holy Face. She died of tuberculosis at the young age of 24. During the final year of year of her life, she wrote a simple book of her memoirs titled The Story of a Soul. Her older sister, Pauline who was prioress of the convent at Lisieux edited the book and published 2000 copies. 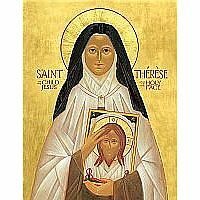 Thérèse's “little way” of trusting Jesus and relying on small daily sacrifices rather than great deeds appealed to many people. She was declared a saint by the Church in 1924 and has been one of the most popular saints of the 20th century, frequently referred to as “The Little Flower.” Among the many people who have found inspiration from her may be included Dorothy Day and Mother Theresa. Her feast is celebrated in the Church calendar every year on October 1. She has now been given the title of Doctor of the Church.